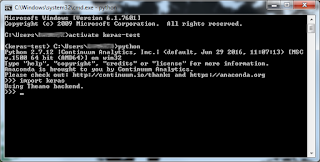 I've started using the Anaconda Python distribution for most of my Machine Learning. It has pre-built binaries of Python for many platforms and architectures, has hundreds of pre-built and tested Python packages directly available through the conda package manager, and it allows easy creation of virtual isolated environments - with its own Python version and packages - to experiment with. You can get an idea of the capabilities of Anaconda by going through their Anaconda Test Drive guide. Getting Keras (with Theano backend) working on any Python distribution is usually straightforward, but you do run into some errors occasionally based on the platform you're on and your environment settings. First, you need to install Anaconda. It's as easy as getting the binary for your platform from Anaconda download page and running it. Once it's installed, the conda command will be available from your terminal or command prompt. 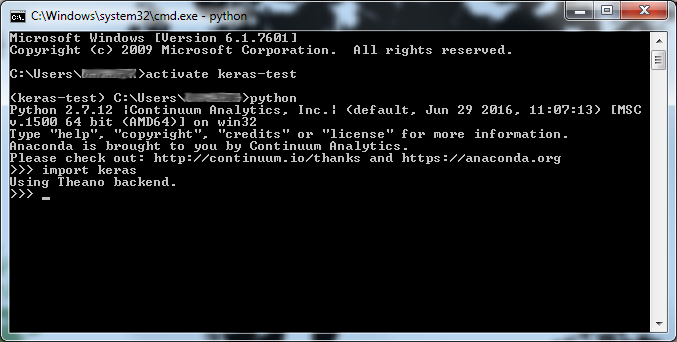 'keras-test' is the name of the environment we're creating. You can give it a different name. Once the environment is created, activate it. Finally, we setup OpenBLAS and configure Theano to use it. My earlier blog post - Getting Theano working with OpenBLAS on Windows - details how to setup Theano with OpenBLAS in detail. If you don't get any errors when the Keras package is loading, then all is set.